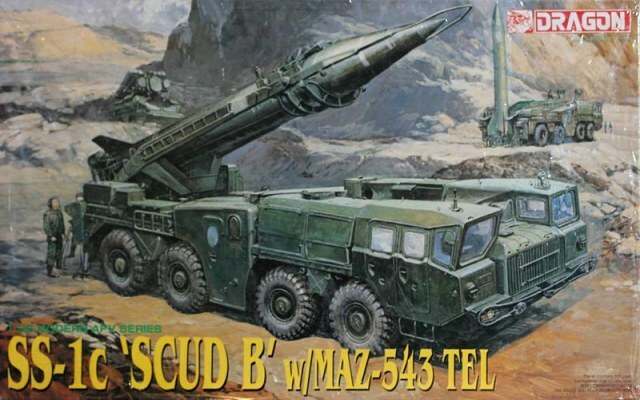 Back in 1976 I scratchbuilt a model of the Soviet SS-1c SCUD B missile system while I was living in Virginia. It was not very good as I had no idea of the accurate dimensions of the vehicle and its components. I was disappointed with the results. But three years later, on 1 January 1979 I started on a second one with some good photos and good dimensions of the missile and launcher. It took nearly five months but at the end of that time I had an accurate model of the SCUD B and the 9P117 launcher for the missile. It had an engine, all doors operated, the missile elevated and rotated on its launcher, and it was also able to demonstrate the self-loading option of the original launcher. The model did well at shows and won many awards, and also doubled as a teaching tool for explaining Soviet tactical nuclear delivery systems. The last time I placed it in a competition was in 1991 at the Association of Military Modelers show in Aberdeen, Maryland. Attending that show were Freddie Leung, head of Dragon Models, and Tony Chin, who at that time was the head of the Marco Polo office that imported Dragon kits into the US. Both of them liked the SCUD B model and Freddie noted that they were preparing a kit of it but had some problems they had not worked out on the model. I gave them the SCUD B model, which I had nicknamed “Bruce” after the mechanical shark in “Jaws”. They bought a tackle box, carefully packed it up and took it back to Hong Kong. This kit appeared the next year (1992) and has remained in production on and off ever since. At the time of its introduction it was an impressive model and could be made into a very good representation of the actual vehicle and missile. At that time its parts count of over 350 was an exception to the rule and imposing. So what has happened over the last 22 years. Plenty. First off the Soviet Union collapsed and after a time all of its SCUD launchers were scrapped. Other countries sold theirs off and first the Budge Collection and then IWM Duxford inherited one from the Czech Republic (another went to the Littlefield Collection) with the result that the launchers and missiles were now available for open study. New molding methods and demand for more details changed the direction of model kits in general and armored vehicles in specific. In short the kit has been somewhat passed by time. The basics are still there to make a good model but it will take work and after market additions (generally new wheels/tires and etched metal) to bring the kit up to speed. What you get in the box is the 9P117M version of the launcher, which did away with the self-loading features (big boxes and hydraulic arms on the sides of the elevation cradle) and made some minor changes to the central module of the vehicle (one porthole per side). The kit provides separate doors for the cabs and the central module, but detail is a bit sparse by today’s standards (at the time only long-range shots of open doors were seen so nobody had a close-up view of the inside). The cabs were painted a seafoam green inside whereas the processing cabins in the central module were an orangish color. (We now know all systems are color coded – e.g. electric, fuel, water, air pressure and hydraulic lines are all painted different colors). The model is assembled by modules – chassis with wheels, cabs/engine hood, service module, central module, launcher module, cradle and missile. Each one is pretty straightforward and the only major parts to leave off until the end are the intra-module fenders (parts E8) in order to get them all to fit on the chassis. The modules attach to the chassis in the order launch, central, service and cab/hood. Once they are in the fenders may be cemented between the central and service modules. A separate base is included for the missile and it may be displayed by itself if desired. Technical assistance was provided by Cookie Sewell (e.g. me), Steve Zaloga and Barry Beldam. Overall it still can be made into a good model but it will take some work. Missing from this kit are all of the cables that connect the missile to the launcher (six of them) so you will need some fine black tubing to make them. The cabs need extra details and an R-123 radio set so some resin bits other than new wheels are needed. Also, some etched metal will add snap to the details of the model. A good set of after-market decals or transfers will spark up the missile a great deal. But at the end of the day, this kit has only one-third the number of parts of at least one of the new release SCUD kits so anyone who wants to build a good enough SCUD system should consider this kit. NOTE: I did not review this kit when it came out (for obvious reasons!) but wanted to provide a baseline review in order to compare this kit with the new releases now coming out from Trumpeter and Meng.